"Okay. The title might seem a bit pretentious, but would anyone really look at Cheese Ball XXXVIII? This is a delicious variation on the holiday cheese ball that has been in my family for close to 40 years. It is perfect served on crusty bread or crackers. One of the nice things about most cheese ball recipes is the versatility. If you want a spicier ball, try substituting a 1/2 cup of pepper jack for the Cheddar. Don't like bacon? Use Nova lox instead. Don't like dill? Fugedabowdit! Dill makes this recipe sing! 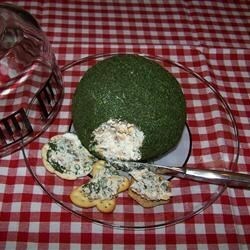 But you can play with the herbs used in the cheese ball. Who doesn't like playing with their food? Serve with crackers or a good bread. Also goes well as a spread for crudites." Mix cream cheese, Cheddar cheese, salad dressing, green onions, bacon, 1 teaspoon dill, thyme, black pepper, kosher salt, Worcestershire, and cayenne pepper in a bowl until ingredients are evenly distributed. Cover bowl with plastic wrap. Refrigerate cheese mixture for 2 hours. Mix 1 tablespoon dill and parsley in a small bowl; spread onto a clean work surface. Shape cheese mixture into a ball; roll in dill and parsley to coat. Drop the potato but keep rockin’ the tots! Fantastic flavor!!! Sooooo easy and really pretty green color too!